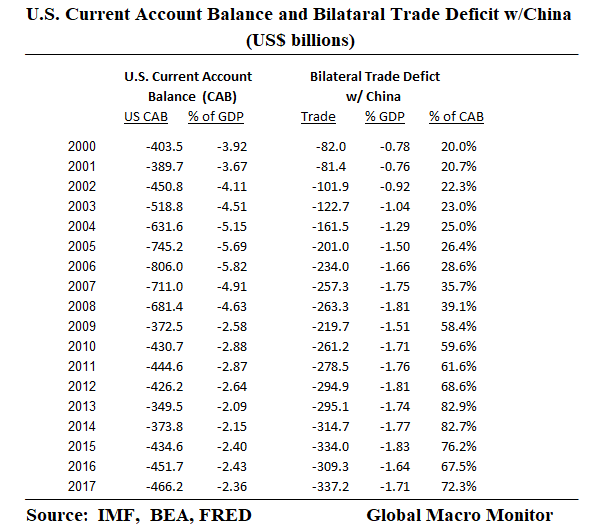 Time for a nice data dump on the U.S. bilateral trade deficit with China, its purchase of U.S. Treasury securities, China’s broad balance of payments, and the U.S. current account balance. There has been much bloviating as to what China might, will, and can’t do with its Treasury holdings so we thought its time for just the facts, ma’am. The U.S. has been running a trade deficit in goods and services with China in the amount of 1.5-1.7 percent of GDP for the past several years. Last year’s deficit totaled $337 billion. China’s purchase of U.S. Treasury securities has declined significantly since the financial crisis. The country has had a problem with capital flight over the past three years, which it appears it has now arrested. 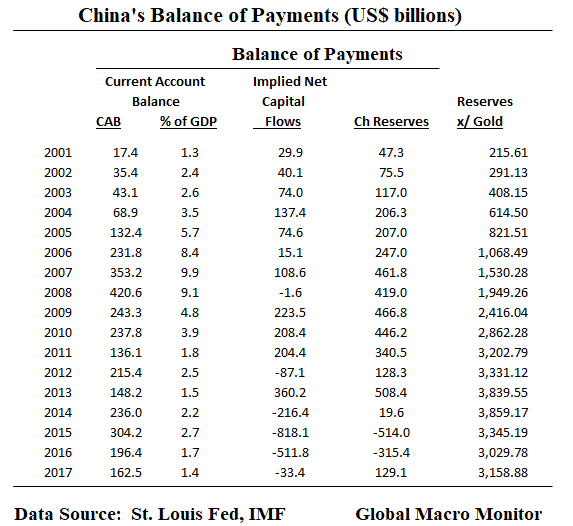 During the height of capital flight in 2016, which saw the country’s international reserves fall by $1 trillion, China sold almost $200 billion in Treasuries. The alternative was to allow a significant devaluation in the renminbi, which would have been a major shock to the risk markets. 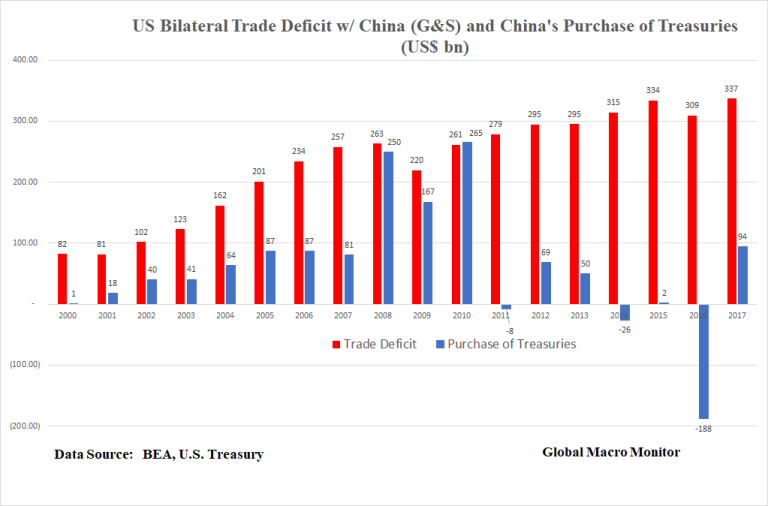 Nevertheless, China’s has recycled, on average, 30 percent of its trade balance with U.S. back into the U.S. Treasury market since 2000. Unlike Germany, China has significantly reduced its current account surplus from almost 10 percent of GDP before the financial crisis to around 1.4 percent in 2017. This is a huge external adjustment. After running large capital account surpluses up until 2014, capital flight accelerated sharply in 2015-2016, resulting in a 25 percent decline in the country’s stock of international reserves. Though the capital account was in a small deficit in 2017, it appears the monetary authorities have arrested the decline in reserves, largely by the implementation of capital controls. The U.S. has also experienced a significant rebalancing of its current account since the great recession. The deficit fell from -5.82 percent of GDP in 2006 to -2.36 percent last year. The adjustment has not been mirrored in the bilateral trade deficit with China. The data illustrates that China is not locked in to buying Treasuries with its surplus. The country can do what ever it wishes with the surplus, which includes selling down its stock of notes and bonds to defend the currency. The Chinese monetary authorities may wish to diversify out of dollars, buy real assets, investment in the Venezuela oil sector, among many of its options rather purchasing Treasury bonds. Most important, foreigners, probably including China, seem to be AWOL from the recent Treasury auctions, which could lead to a big problem for the risk markets down the road. We continue to expect real yields to rise given the toxic combination of a large increase in new supply as a result of rising U.S. budget deficits, the Fed moving from largest buyer to a significant net seller, and, what appears to be, a strike by foreign buyers. 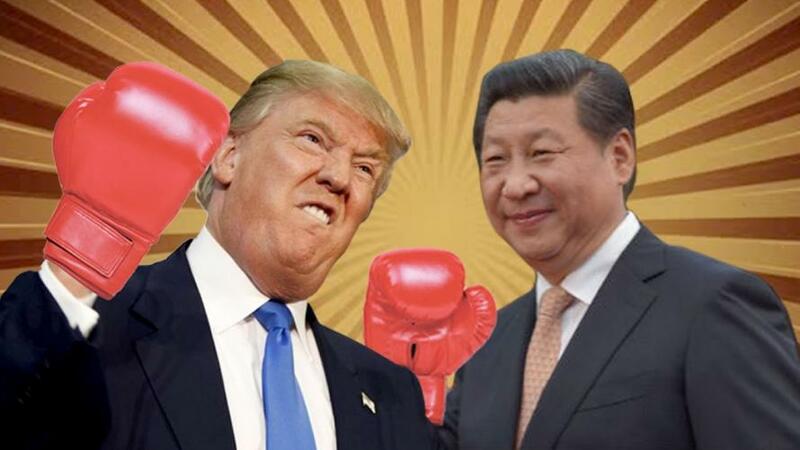 And we haven’t even discussed China’s nuclear option in the trade dispute with the U.S..